Former Arsenal star, Robert Pires is confident that the Gunners will have a Champions League football next season. The race for the Premier League's 'top 4' tightens up as Arsenal, Manchester United and Chelsea secured all three points in the last round of fixtures. Arsenal are currently fourth in the Premier League table with 56 points, one point clear of Manchester United and three ahead of sixth-placed Chelsea, who have a game in hand. 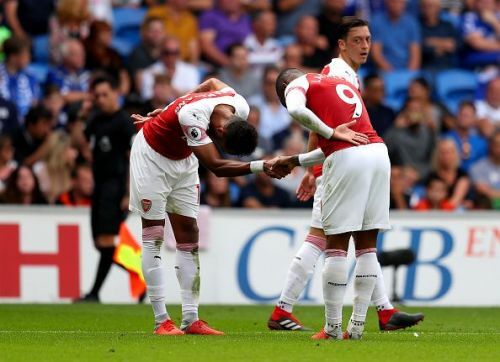 The Gunners earned a reputation for consistently finishing in the top four under their ex-manager, Arsene Wenger and will be looking forward to repeating that fate in the guidance of their new boss, Unai Emery this term. On the other hand, Robert Pires played 283 games in all competitions for the Gunners between 2000-2006 and won two Premier League titles and two FA Cups during his time at the club. The Frenchman announced his retirement from the professional football in 2015 and played for three different clubs after leaving the Londoners in 2006. Speaking to BWIN(via Mirror), Robert Pires believes that his former club will play in the Champions League next season. "I’m very confident Arsenal will have Champions League football next season because we have the Europa League as a safety net,"
"It’s such an incentive to win that trophy knowing it guarantees Champions League football and the players will have a lot of confidence due to Emery’s success in the tournament." "It’s so important that Arsenal secure Champions League football for next season. "It’s looking really tight at the moment because there’s probably only one spot available and we’re competing with Chelsea and Manchester United for it. "I think the next two games against Tottenham and Manchester United are crucial because Arsenal have a favourable fixture list for the remainder of the season. "I think Arsenal have a real chance to build momentum and will sneak into fourth position ahead of Chelsea and Manchester United." Arsenal will play their cross-city Tottenham Hotspur next in the league before making a trip to France to play Rennes FC for the first leg of the Europa League round-of-16 tie on March 7.